After Hillary Clinton's shocking loss I was convinced we had seen the last of the pantsuit. The pantsuit tried unsuccessfully to help its wearer win the office of President and when it failed its reputation was besmirched. However, I am happy to report one of Mrs. Clinton's enduring legacies might be her reintroduction of the pantsuit into mainstream culture. Melania Trump recently wore a classic pinstripe suit with a bow untied to welcome Canadian Prime Minister Justin Trudeau and his wife Sophie to the White House. This look was feminine and edgy and one of my favorites. 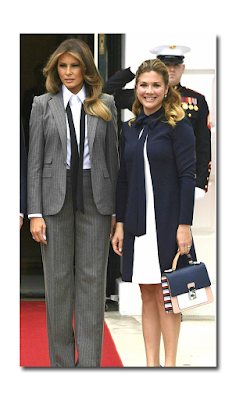 A first lady in a pantsuit is not a familiar sight and yet Melania pulled this look off effortlessly. Ivanka Trump and Hillary Clinton both attended the Donald's inauguration in white pantsuits. Ivanka wore a sweeping off-white Oscar de la Renta suit that she paired with a long coat that was extremely daring for an inauguration ceremony. Recently Blake Lively, the queen of femininity, wore a three piece menswear suit from the Ralph Lauren Fall 2017 collection, complete with a tie and cravat. Blake's look had the fashion community in a tizzy-love it or hate it no one could decide. At the Fall Ballet gala Anh Duong wore a Dolce and Gabbana Alta Moda blue pantsuit while Xenia Lukash appeared in a men's tuxedo to the delight of Hamish Bowles. Is this the beginning of a new era for this androgynous look which has never really gained traction with women? I am not sure but pantsuits have been around for a long time and it's about time women gave this fashion statement a second try. 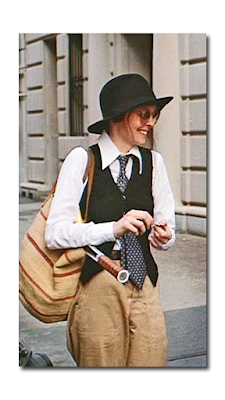 The history of pantsuits can be dated back to the 1920's when designers such as Foale and Tuffin in London and Luba Marks in the United States heavily promoted trousers for women. Actresses Marlene Dietrich and Katharine Hepburn were often photographed in pants during the 1930's. In 1964 Andre Courreges introduced minimalist pantsuits for women for day and evening. Until then pants had never been worn for formal occasions. In 1966 Yves Saint Laurent revolutionized the industry when he designed a formal tuxedo that he named "Le Smoking" for women. 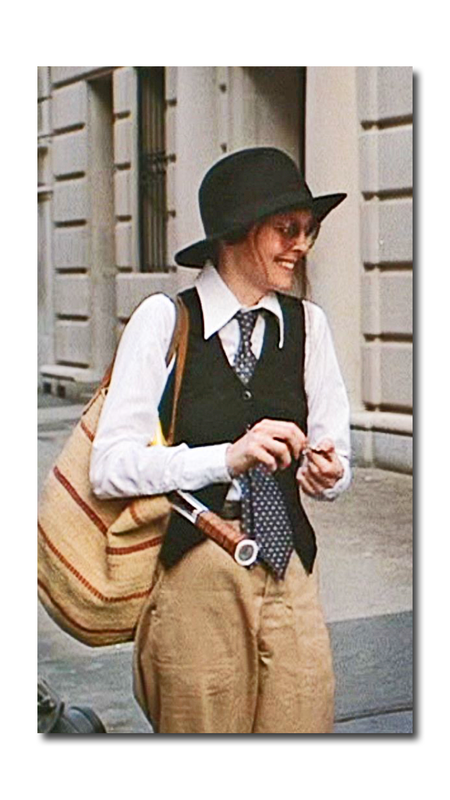 During the 1970's pants became quite fashionable for women especially with the release of "Annie Hall" in 1977 where Diane Keaton made a three piece suit the ultimate fashion statement.There is no actress who has been able to pull off the pantsuit more effectively than Keaton. Surprisingly, women were not allowed to wear pants on the U.S. Senate floor until 1993 when Senators Barbara Mikulski and Carol Moseley Braun defied the rule-leading to an amendment permitting women to wear trousers as long as they were accompanied by a jacket. Some of the most iconic red carpet looks contain women in pantsuits and they include fashion stars Angelina Jolie, Gwyneth Paltrow, Julia Roberts and Celine Dion. In 1990 Julia Roberts took over the red carpet when she attended the 47th Annual Golden Globe Awards in an oversize Giorgio Armani pantsuit. For a newcomer in the industry this was a radical move especially when accompanied by a tie and brown oxfords. 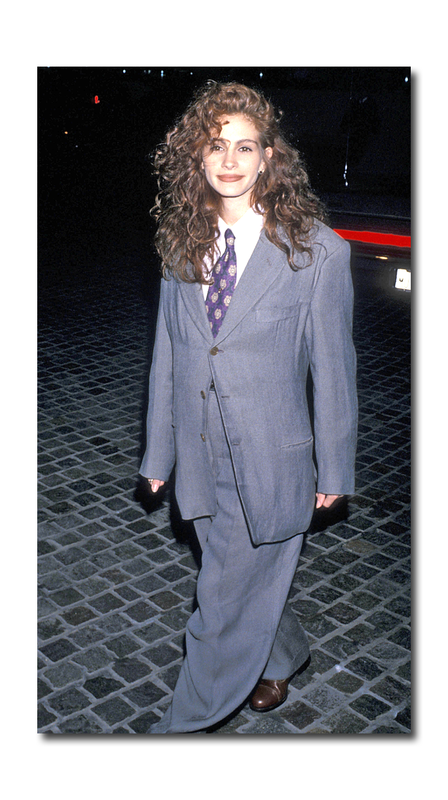 Everyone loved this daring look and she even won the Golden Globe for best supporting actress in "Steel Magnolias." Let's not forget Celine Dion who wore a backward white John Galliano tuxedo to the 1999 Oscars which was extremely avant-garde at the time. While many mocked her look it has stood the test of time and proven to be a brilliant fashion move that has been referenced dozens of times. Style icon Gwyneth Paltrow wore a red velvet Tom Ford for Gucci tuxedo to the 1996 MTV Movie Awards that the fashion press adored. This is considered one of her best red carpet looks ever and ushered in her ascendancy to the fashion hall of fame. One of my favorite modern looks was that of Angelina Jolie in a matching tuxedo with her then husband Brad Pitt to the 2014 British Academy Film Awards. 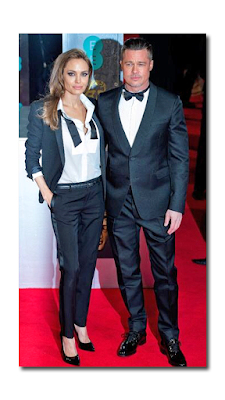 The mother of four wore a Saint Laurent by Hedi Slimane tuxedo with the bowtie undone, perfectly showcasing her effortless beauty. This is the last winning look I can remember of the photogenic couple. 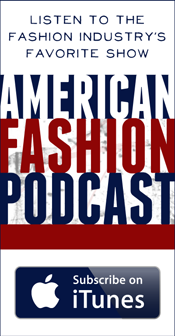 Every major designer this past year included pantsuits in their collections including Gucci, Elie Saab and Dior. Even the ultra feminine Marchesa showed pantsuits in its 2018 collection. Furthermore, Chanel the home of the classic jacket-skirt combination showed numerous pantsuits and short suits in this year's Ready-to-Wear Collection. In fact the short suit, a variation on the pantsuit might be a dominant trend in the coming year. Most shockingly, the introduction of pantsuits into this year's bridal collections from such traditional fashion houses as Monique Lhuillier and Lela Rose was revolutionary. 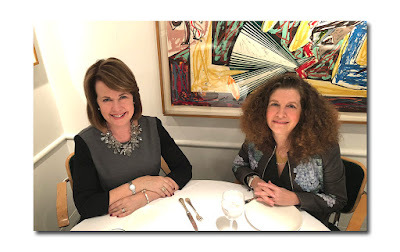 I myself prefer a skirt or dress for a formal evening affair; however, I am more than willing to give the pantsuit a try as long as I can relinquish the tie and cravat to my father.